"Long before the world was formed, Satan and those who followed after him raged against the forces of good and tried to overthrow the work of God. That struggle has not ended, only shifted battlegrounds. It is ruthless, and relentless; the objective of the battle is your eternal soul and mine. "'Be strong in the Lord, and in the power of his might. "How do we put on the whole armor of God so that we may, as Paul promises, 'be able to withstand in the evil day'? 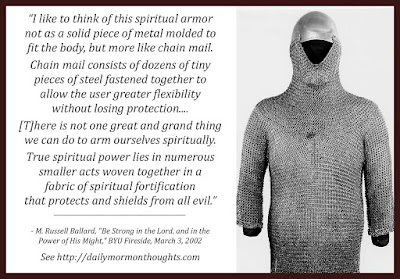 "I like to think of this spiritual armor not as a solid piece of metal molded to fit the body, but more like chain mail. Chain mail consists of dozens of tiny pieces of steel fastened together to allow the user greater flexibility without losing protection. I say that because it has been my experience, covering many more years than you have yet been privileged to live, that there is not one great and grand thing we can do to arm ourselves spiritually. True spiritual power lies in numerous smaller acts woven together in a fabric of spiritual fortification that protects and shields from all evil. "It is a common expression to talk about the 'chinks' in a person’s armor. The definition of the word chink is 'a crack, cleft, ... a narrow opening' (Webster’s New Universal Unabridged Dictionary , s.v. 'chink,' 361). Should an arrow strike exactly one of the chinks in one’s armor, a fatal wound can result. "I would like to suggest to you six ways we may protect ourselves by eliminating any chinks or gaps in our personal spiritual armor. "6. 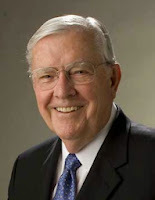 Remember That Reverence Invites Revelation." We must actively weave our own mail through "numerous smaller acts" of righteousness and faithfulness. A well-woven mail will continue to provide great flexibility in life, while also providing great protection. Sadly, it doesn't take much of a "chink" in the armor to make it less than secure; and Satan is expert at exploiting chinks. Elder Ballard gives wonderful advice in this talk about the habits and practices that will provide a secure and strong spiritual armor for us.